John Rosemond says: “This book is the foundation of all of my writings. It contains a comprehensive description of my philosophy of child-rearing—organized around my concept of “The Three R’s of Traditional Parenting”—as well as very specific advice on how to translate that philosophy into action. "As a mother with a large family by today’s standards (5 children), there is no way I would stay sane using today’s “psychological” parenting methods. 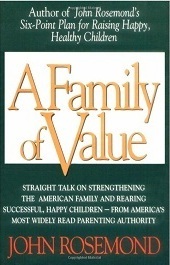 A Family of Value book is the only parenting book that I have read that actually gives parenting tips that I can apply. So much of the “psychological” parenting advice is so tedious and requires so much thinking about every little thing that I gave up due to it being so overwhelming and time consuming. The tips in this parenting book, however, are simple, clear, common sense and WORK. If I seriously tried to be a parent of today and thought I had to spend hours on the floor with each child (separately) and had to make charts for this and that and had to pay 2K a month for this and that activity for 5 kids, I would be in the looney bin. Thanks, Mr. Rosemond, for letting me and other parents know it is OK to not do all this stuff."